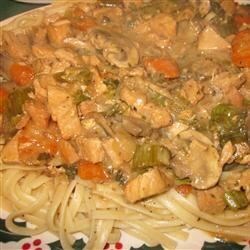 "This is a creamy, tender and very tasty chicken dish. Cooking it in the slow cooker makes it so easy!" In a slow cooker, mix together the soup, onion, parsley, wine, garlic powder, milk, and mushroom pieces. Season with salt and pepper. Place chicken in the slow cooker, covering with the soup mixture. Cook on Low setting for 5 to 6 hours, or on High setting for 3 to 4 hours. See how to make a simple, satisfying chicken dinner.